Today’s headlines are all about the new record levels for the oil price. But is it a record? No, not in inflation adjusted terms, see chart below (full size chart here). 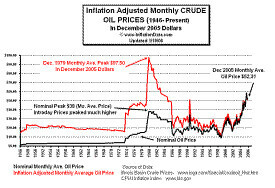 Oil prices were much higher in December 1979. “The real peak occurred back in 1980. Back then the monthly average price peaked at $38 per barrel (although the intraday prices spiked much higher). – There is no reason to assume there will be a decrease [in the oil price], Ulf Svahn, Managing Director of Svenska Petroleuminstitutet, told Dagens Industri this morning. Sure, that’s what you would expect a spokesperson from the oil industry to say, wouldn’t you? Footnote: I have written about this before. Previous Previous post: Who’s calling who a fatty?